Nancy Boyd as she appeared in the 1960 Alhambra Torch yearbook. When President John F. Kennedy signed the bill creating the Peace Corps on March 1, 1961, young people all over the country responded immediately. One of the early applicants was 1960 Alhambra graduate Nancy Boyd, then a freshman at UC Santa Barbara. Sally Sullenger, Nancy's classmate who grew up with Nancy as both families were very close friends with the same wedding anniversary and two children the same ages, was the first Martinez resident to join the Peace Corps and was already on assignment in Sarawak on the island of Borneo when Nancy finished her training and flew to her posting in the Philippines in September, 1962. "We were taught to give of ourselves" recalls Sally as one of the reasons she and Nancy and classmate Will Newman responded immediately to Kennedy's call to international service. Off on the biggest adventure of her life thus far, Nancy had been trained at San Jose State University to be a teaching aide in English and science in Mabini, Davao on the island of Mindanao. Soon letters arrived in Martinez describing the beauty of a tropical evening and the large variety of familiar and unfamiliar insects as well as the challenges and rewards of helping people in another country and culture. But the big adventure was fated to become her last adventure on March 2, 1963 when the Philippines Airlines DC-3 carrying her and another Peace Corps Volunteer (PCV), Phillip Maggard of Buffalo, Wyoming, crashed into a ridge 450 miles south of Manila killing all 28 on board. The pair was returning from a training conference in Zamboanga City. They were among the first of what is now over 200 PCVs to die while serving. "The community grieves for Nancy Ann Boyd," wrote Contra Costa Gazette editor Bill Sharkey III in Column One the following Monday. "Martinez knew Nancy Boyd and we all glowed with pride as she went to the far side of the globe with another fine young woman, Sally Sullenger, of Martinez, to help those in faraway lands who have so few advantages and need so much help." Coincidentally, the tragedy occurred just the day after the second anniversary of the Peace Corps which is now observed annually as Peace Corps Week. Both events will be commemorated in Martinez this Saturday, March 2, at Nancy Boyd Park. Friends of Nancy's during her youth in Martinez are helping Returned PCV Robert Goldstein organize an event to be held from noon to 2:30 p.m. at the park. The public is invited to attend along with friends of Nancy's and all Peace Corps returnees. Nancy was the daughter of Paul and Dorothy Boyd and lived with them and her older brother, David, in the family home at Lafayette and Ward Streets. She belonged to the Camp Fire Hi Time Horizon Club, was editor of the 1960 Alhambra Torch yearbook, active on the Student Council, a cheerleader, a Job's Daughter and was chosen as an Alhambra Basketball Team sweetheart. "She was known for her personality, kindness and intellect," recalls childhood friend Donaleen DiBetta who is part of the organizing committee. Paul Boyd worked for Shell and Dorothy worked for the County. "They were a very close family," recalls Donaleen. "They always welcomed Nancy's and David's friends into their home. Nancy was a beloved daughter." The tragedy caused an outpouring of grief not only in the community but in the nation's capital. Peace Corps director Sargent Shriver immediately responded. "Nancy and Phil were both outstanding volunteers who were performing a very valuable service to mankind and their country". The Gazette reported that Philippine President Macapagal telegraphed President Kennedy to say that the two volunteers' "work in our country will long live in the hearts of our people. Kindly convey our sorrow to the American people." California Senator Thomas Kuchel issued a tribute in the Senate praising the lifelong Martinez resident as "a heroine of the Cold War". Congressman John Baldwin spoke in the House of Representatives and was the featured speaker at the dedication of Nancy Boyd Park in November, 1964. The Philippine government and Philippine Airlines saw to it that her remains were flown home immediately at no expense to the family or the Peace Corps. The Consul General and a representative of the airline joined Peace Corps official Timothy Adams representing Shriver at funeral services the following Saturday. Mayor John Costanza and members of the City Council were among the public officials joining family and friends including Nancy's Horizon Club friends at the services. The Philippine government and airlines later hosted Nancy's parents to visit the village where she had worked to dedicate a library in her memory and to tour the country their daughter had helped. 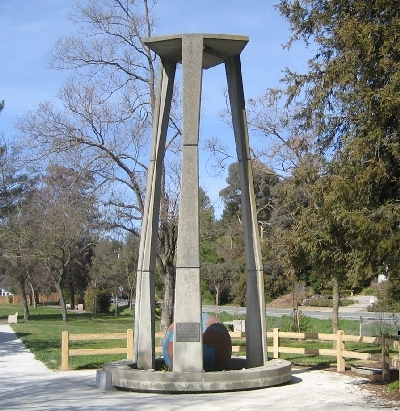 20 months after her death, the six acre Nancy Boyd Park was officially opened in Martinez with a Universal Peace Fountain designed and built by local contractor Ralph Swanson, Richard Haisley and Roy Lewis. Although it is not currently functional, it stands in the park on a platform constructed from rocks from all over the world. Sally is sure she can remember which rock comes from her posting in Sarawak. The park was upgraded in one of the first projects funded by the Measure H bonds passed by local voters in 2008. Martinez City Council member Anamarie Avila Farias was mistress of ceremonies at a recent event. Among the speakers were Mayor Rob Schroder, former Mayor and current councilman Mike Menesini and the returned PCV who sparked the event, Rob Goldstein. He learned about Nancy from Menesini and thought the anniversary would not only honor Nancy but remind people of the Peace Corps' half century record of service and sacrifice. Nancy's friend Sally Snook de Lipkau will read from some of the letters she and others received from their friend. Letters from classmate and fellow PCV Will Newman and from Nancy Andal of Florida who was Nancy's PCV roommate in Mabini were also hared. A YouTube video has been posted of the ceremony, courtesy of the Martinez-Gazette and their reporter Gerardo Recinos who put together the video. You can click on it here to watch the ceremony. Be sure to read the essay "Nancy Andal Recalls Peace Corps Service With Nancy Boyd", which can be found on our "Events" tab. It contains memories of Nancy's Peace Corps roommate, Nancy Ann Andal, who describes what it was like to be the first Peace Corp Volunteers in a village on the island of Mindanao 50 years ago.